It won't be long now...the steel barriers are going up ready for the Monaco Grand Prix. 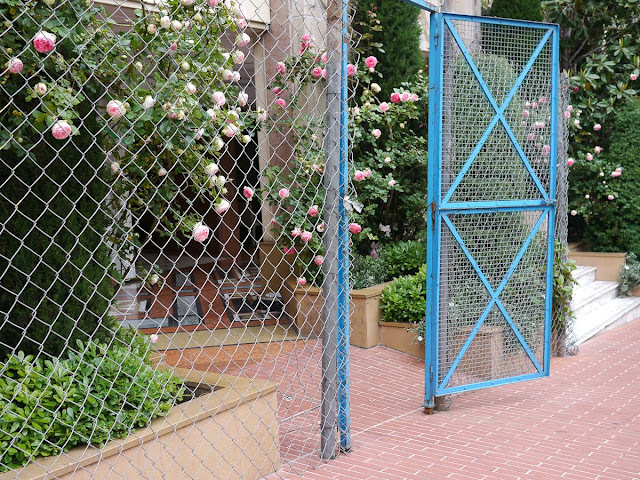 This is the restaurant we saw yesterday - the roses look a little different behind a wire fence. Note: this is simply a light interior barrier - the outer barrier is much tougher. It looks like it might struggle to control people that alone screaming racing cars! Wish that holiday offer was on now, as it would be fab to be there for the grand prix. Hope you'll keep us well supplied with photos, and now you're the famous Monaco blogger, you might even get to go a bit closer to the cars. Thanks for that Eddie. Interesting to know the name. I took some pics the other day but will be going in again this Saturday and probably get better ones. Gailsman, I doubt I'll go to the Grand Prix this year so am sorry about that. Both lots of friends who lived over the Start/Finish line have moved but who knows. It's not in the plan to go in tho this year. I'll go in next year for the Historique. At least to photograph the cars in advance. I am so glad I've refound your blog--love your scenes.